The sperm whale, known to science as Physeter macrocephalus, is the largest of the toothed whales, which includes other members such as the dolphin and killer whale. These whales get their name from the oily fat, known as spermaceti, which is contained in their large heads. It is because of this substance and the oil from the whale's blubber that these majestic animals where viciously hunted by whaling boats. In older times, sperm whales were known as common cachalot, which was an old French word for "tooth". As with all whales, sperm whales are mammals and require air to breathe. They are one of the deepest diving mammals in the world, and are able to stay underwater for up to two hours before coming up for air. water to grab a breath of fresh air. The sperm whale can grow to a length of 67 feet (20.5 meters) and weigh over 63 tons (57,000 kilograms). Sperm whales are one of the most sexually dimorphic of all the whale species, meaning that the males and females differ greatly in size and weight. The males are generally 30% to 50% larger than the females. The whale's large head accounts for up to two-thirds of the animal's total length, and it has the largest brain of any animal in the world. Unlike most other whales, which have smooth skin, the skin on the back of the sperm whale is rough and wrinkly. In fact, it has been compared to that of a prune by many whale watchers. The sperm whale does not have a pronounced dorsal fin on its back. Instead, it has a series of ridges, the largest of which resembles a small hump. The color of these whales is usually a uniform gray, although they sometimes look more brownish-gray in sunlight. White albino whales have sometimes been observed in the wild. Like other toothed whales, sperm whales use echolocation to find their food. They create a series of high-frequency clicks through cavities in their skull. 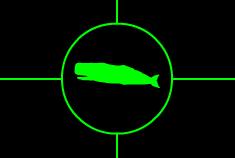 These clicking sounds reflect back off of fish, squid, and other animals, allowing the whale to virtually see in the dark. 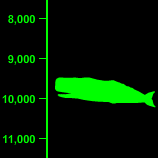 This skill comes in handy as the sperm whales search the dark ocean depths for food. Their favorite meal is squid, and these whales are one of the only natural enemies of the legendary giant squid and its larger cousin, the colossal squid. While these battles between the world's two largest predators have never been observed directly, much evidence has been found on the bodies of dead whales. The remains of these massive squid have been found in the stomachs of the whales, and scars from the powerful suction cups of the squid's arms have been found on the whales' skin. The whales will dive as deep as 10,000 feet (3,000 meters) in search of the massive squid, although they more typically hunt at about 2,600 feet (800 meters). These deep diving hunting trips can last as long as an hour. It is believed that the hard beaks of the squid in the whales' intestines leads to the production of ambergris, a sweet-smelling substance that was once used to make perfume. Sperm whales consume nearly three percent of their body weight in food each and every day. Sperm whales are social animals. Females tend to stay in groups of about a dozen individuals along with their young. The males usually leave these schools between the ages of 4 and 21 years to join bachelor schools with males of a similar age. As the males grow older, they tend to stay with smaller groups until they grow old enough to live a solitary life. In spite of their reputation as a fierce hunter, sperm whales have a natural enemy in the form of the killer whale, also known as the orca. Pods of orcas have been known to target groups of females where they try to separate the young whales from their mothers. The female whales attempt to protect their babies by forming a circle with the young calves in the center. They use their teeth and tales as weapons against the invading killer whales. 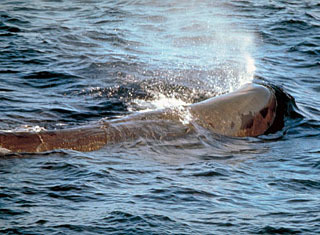 It is believed that only the largest and oldest sperm whales are immune to the attacks of the orca. In the wild, sperm whales are believed to live about 70 years. Like all whales, they give birth to live young. A single young calf is born after a gestation period of about 14 to 16 months. The calf will suckle on its mother's milk for up to 42 months. Females reach maturity at between 7 and 13 years of age, while males generally do not mature until the age of 18. Male sperm whales do not reach their maximum size until about 50 years of age. hunted for their oil and meat. Sperm whales were once the target of the whaling industry and their numbers were decimated by over hunting. They were prized for their oils, which were used to manufacture candles, soaps, cosmetics, lamp oil, and a number of other products. Ambergris, a waxy substance found in the whale's digestive system, was used to make perfume. The whales were also hunted extensively for their meat. 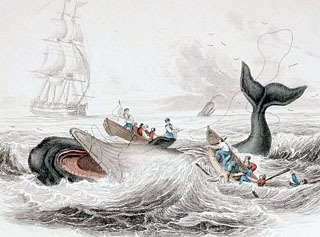 During whaling operations over the last three centuries, it is estimated that the global population was reduced from 1.1 million to only 360,000. Today, the sperm whale is protect in most parts of the world. Only Japan and Indonesia still hunt and kill them. They are currently listed as a vulnerable species, and their biggest modern threats are from fishing nets, pollution, and ocean debris. Sperm whales are found in nearly all of the oceans of the world, from polar waters to the equator. They are found in most marine waters deeper than 3,300 feet (1,000 meters). They are particularly plentiful near continental shelf regions and ocean canyons, where they hunt for deep sea squid at depths of up to 10,000 feet (3,000 meters). Although both sexes can be found in temperate and tropical regions, only the adult males move into the higher latitudes.